I usually don't review Doctor Who two-parters until they're finished, but I'm not going to sit on the mid-series finale until fall. For it needs saying that despite the wide acclaim for A Good Man Goes to War, it's not terribly impressive. It's rather a lot of non-story and cobbled together fanwank that feels consistently undramatic throughout. The first piece of un-drama is the not-war, completely failing the title's promise. We are to understand that the powers of Demon's Run are so frightened of the Doctor that they kidnap his companion's daughter, whom they know will become a Timelord, in order to use against him as a weapon. Yet in a room full of armed soldiers, they allow him to grandstand without shooting him. This is worse than his motormouthing against the Silence at the end of Day of the Moon, where at least River Song had a gun trained on the baddies to maintain some credibility. When all is said and done, it certainly doesn't feel like the Doctor has risen "higher than ever before", as River forecasted, nor do we get anything remotely approaching his dark side seen in stories like Waters of Mars and Amy's Choice. It feels like what it is: a not-war in which the Doctor saunters onto a base, has a bit of fun on stage, and is suddenly in control. Of course, the point of the not-war is that the Doctor is being allowed to take over Demon's Run and rescue Amy's daughter as part of a bluff. The baby turns out to be an almost substitute in the same way Amy herself has been throughout the season. But even here the suspense doesn't carry as it should, for two reasons. First, the identity of the baby hasn't been the mightiest of mysteries; a link between Lady River and Ms. Pond has been suspected for some time. It's not even clear in any case why River being Amy's daughter had to be kept such a dark secret all this time. But more to the point: the cliffhanger is so feel-good and happy that it's both undramatic and melodramatic despite the revelation. When most of our heroes are standing around smiling and giggling, the stakes couldn't feel any lower, when it's the Doctor himself who is supposed to be brought "lower than ever before". The third bit of un-drama is the lack of scares, a cardinal sin in any Doctor Who story. The headless monks were a wasted opportunity, and used so ineffectively beyond converting a soldier at the beginning. Not even Eyepatch Lady (Madame Kovorian) feels terribly menacing. But what really caps it all off is the host of villains -- Silurians, Sontarans, Judoon, etc. -- who are far-fetchedly assembled as the Doctor's allies on account of debts they owe him. 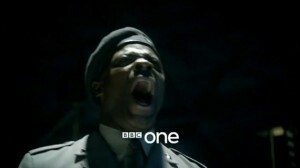 It's rubbish, really, and starting to look like fanwank formula on Moffat's part. 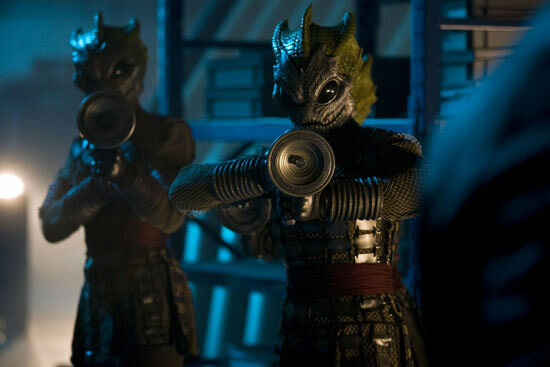 At least in The Pandorica Opens, the fanwank was pressed into the service of an actual menace, as the Stonehenge Alliance opposed the Doctor and threw him into an eternal prison. Here we get a benign Sontaran nurse and a Dexter-like Silurian who kills serial killers, while the best the opposition can boast is a loud-mouthed colonel who's full of bluster and hot air and nothing more. I again realize that it's not really fair to judge a two-parter halfway through, and I'm hoping that Let's Kill Hitler will deliver the goods like the The Big Bang paid off its own rather questionable precursor. But if I had to rate A Good Man Goes to War on its own, it would get 2 stars out of 5, making it easily the most disappointing installment so far of season six. UPDATE: Let's Kill Hitler fails to deliver. 2 stars for both. Hmm … I'm not as negative as you, but I don't think it rises above three stars. Then again, I have never over-rated Moffatt's story-telling gifts as I feel you have done. You left out what I found most annoying, that the sole purpose of dressing Rory as a Roman seemed to be to tease in the trailers, but with no payoff at all in the story line. Well, I'm hoping the second part will bring it up to at least 3 stars. I disagree with you, Loren. A fabulous episode. 5 out of 5. One of my favourites of the Matt Smith era so far and a great relief after the mediocre two-parter we've just had. In the Moff we trust! It was a little dissapointing. The Doctor's allies - since we didn't know them, we couldn't feel for them. With decades under its belt, I'm sure we could come up with some allies from past stories. But most irratating was Rory dressed as a Roman, and for no good reason. Very dissapointing. But I wonder if we overanalyze. My 11 year old son just thought it was awesome.